That is a great question, here is my opinion on Clarity Enhanced diamonds, otherwise known as CE Diamonds. Clarity in a diamond refers to how “clean” the diamond is and/or appears. Clarity Enhanced Diamonds improve the “look” of certain types of Diamonds. When a stone has a “feather” or “crack” that reaches the surface of the diamond, it often reduces the clarity considerably. Similar to the technique of “Oiling an Emerald“, CE Vendors “treat” such diamonds by inserting a glass-like substance into the crack to reduce the negative “appearance”. This glass-like substance has a closer Refractive-Index to Diamond, so light passes through the crack with less distortion, often improving the clarity considerably. The downside to this is that it also hides from an appraiser or lab a view into how deep a fissure is. Therefore it becomes almost impossible to know if that diamond will have an issue with durability. Some feathers are “benign” in terms of durability, yet have a major impact on the aesthetics of the diamond because for example the placement of the feather might be under the table or in another example it might reflect several times causing it to appear worse than it is. By the same token, some feathers don’t have to look as bad as they are, but might break the surface of the crown and pavilion, which places it at greater risk to eventually crack in two after hitting a hard surface. If CE diamonds were sold differently, this wouldn’t be a big issue. If the consumer received a GIA certificate that was obtained before the enhancement took place, then you could determine if the stone you are buying has a risk of cracking or not. 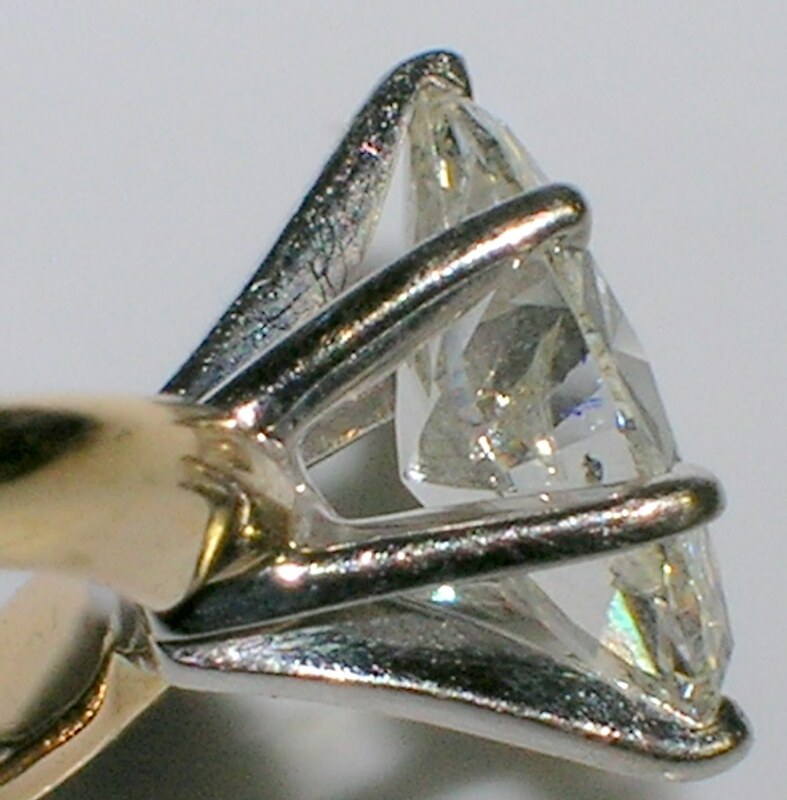 Another problem with the current way CE Diamonds are sold is that the discount is applied to the new clarity obtained after treatment, rather than on the basis of the actual grade before enhancement. There is also no discount for a durability risk. So you might pay $3000 for two different diamonds, one of which has a minor feather and the same for one that might break in two by getting knocked against the wall. While the vendors’ tend to offer guarantees that if the treatment gets removed, they will re-treat the Diamond for free, they do not guarantee to replace a Diamond that cracks. Until these issues are addressed by the CE Manufacturers, the consumer has a lot to consider before feeling that the discounted price is worth the risk. Jason, I hope this helps. This feather highlights an example of a diamond that could potentially get clarity enhanced to great effect. If that feather is prominent face up, CE can make a dramatic improvement in appearance. Am I wrong to think that laser drilled diamonds is a different category of altered diamond and possibly a better purchase than a fracture filled stone? You are 100% correct. They are completely different. Laser Drill holes are easy to detect, permanent and have no impact on durability. They simply remove black inclusions. The issue about cracking diamonds is indeed a very important consideration when thinking of buying a clarity enhanced diamond. If you are not an expert, this should also be a worry when buying any natural diamond of low clarity. Generally speaking, “open” inclusions (those that reach the surface) are usually traded much lower however can be graded as high as SI in some cases. Certification of clarity enhanced diamonds should show all original inclusions, whether they are visible to the naked eye (or under 10x loupe) or not. All imperfections are visible under suitable light and 40x magnification. This issue is the main reason why GIA will not certify diamonds that have been clarity enhanced. As with most things, either you need to have an expert/vendor that you trust, or be an expert yourself to ensure you are getting a sound deal.